To be quintessentially Ford, a car needs to have good build quality, great suspension and excellent drivability. We drive the latest Figo to see if it still possesses those traits. In terms of sales volumes, the Figo did wonders for Ford India. 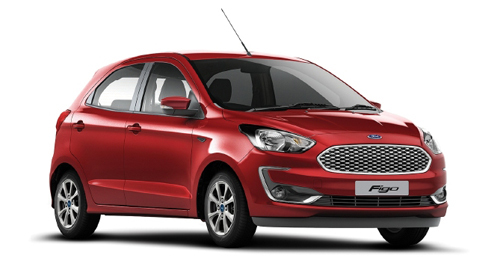 Ever since the first-generation Figo was launched in India, Ford’s sales charts took a massive leap. Fundamentally, there were many reasons for this success – the Figo was frugal, with excellent suspension and fantastic steering feel. In short, it was a car that people enjoyed driving. Of course, the Indian market has evolved massively since the launch of the first Figo. And, with increasingly stiff competition, the benchmarks are changing rather quickly. In such a competitive market, the new Figo – with over 1,200 changes, according to Ford – is aiming to pose a serious challenge to the segment leaders. First up, as far as the design is concerned, it retains a balanced stance and that big Ford family front grille – now available in a Black finish on the Blu version that you see here. The Blu edition also comes with 15-inch alloys as standard, while the rest of the range gets 14-inch wheels as standard. Inside, I quite like the all-black interior, which is a rare find in the beige-obsessed Indian market. The neon blue highlights on the car – both inside and out – are a nice touch. The standard fit 7-inch touchscreen is also quite pleasing to operate, even though it misses out on Ford’s latest SYNC multimedia system. On the safety front, the Figo comes with two airbags as standard, with the topmost variants getting six airbags and ABS. Under the bonnet, the Figo now comes with three engine options – two of which we got to sample on our test drive. First is the de rigueur diesel engine. Then, there are two petrol engine options. The manual version of the Figo in petrol trim comes with a 1.2-litre engine with 95bhp, while the sole automatic version comes with a 121bhp, 1.5-litre engine paired to a six-speed transmission. On the road, the Figo feels like an improvement on the typical Ford traits. The car rides fantastically well, and even at high three-digit speeds, the stability is simply fantastic. Of course, like all Ford products, there’s a lot of feedback from the steering, which makes driving the Figo quite a lot of fun. I quite enjoyed the real steering-feel in a mid-sized hatchback after a long while – something that definitely adds to the overall driving experience of the car. But there are a couple of issues with the diesel version of this car. For one, it desperately needs a sixth gear, which would help both its power delivery and efficiency. With just five forward gears, it feels as if it’s being held back just that little bit. Secondly, the NVH of the diesel engine also needs some work, as, at revs above 3,000rpm, there were significant vibrations being transmitted through the steering wheel. The 1.2 petrol engine, however, blew me away – quite literally. I have distinct memories of driving the last generation Figo with its 1.2 petrol engine – specifically, how gutless an engine it was. But this new unit is fantastic. It has loads of torque, responds well to throttle inputs and is genuinely nice to drive. A shockingly good improvement, in my opinion. With its style updates, along with fantastic engines and genuine driving appeal, the Figo makes a strong case for itself. And, with the newly announced pricing – which is more affordable than the segment leader, the Maruti Suzuki Swift – and a renewed focus on after-sales and service, the Figo is definitely a strong contender if you’re in the market for a mid-sized hatchback. X-factor: If you’re looking for a powerful, feisty hatchback, the Figo is a perfect choice.